University President Steven Knapp's annual compensation totaled about $1.12 million in 2014, a 13 percent drop from the previous year. University President Steven Knapp’s total compensation package last fiscal year left him with about 13 percent less than he earned in the previous year, according to University tax forms. Knapp was paid about $1.12 million overall in fiscal year 2014, $170,000 less than the previous fiscal year. Even with the 13 percent decrease, which is the largest cut he’s received in recent years, that total still secures Knapp a place as a one of the most highly compensated private university presidents nationwide. Although Knapp’s base salary increased by about 5 percent as it has for the fifth year in a row, his benefits and bonuses — extras that are voted on by the Board of Trustees — dropped about 43 percent, according to the tax forms. The cut marks the first time the Knapp’s bonuses and benefits have decreased since fiscal year 2012, when it dropped about by 21 percent compared to the year before. Knapp’s total compensation of $1.28 million in fiscal year 2013 was the highest payment he has ever received since coming to GW in 2007. Smith confirmed that the decrease “is not related to performance or to budget cuts,” and added that the Board of Trustees’ Governance, Compensation and Nominations Committee looks at a variety of factors before making its decision. “In making its assessments, the committee obtains compensation information provided by an independent consulting firm that includes market data from comparable universities as appropriate for his skills and experience, and is commensurate with national universities of our reputation as well as geographic location of the University,” she said. The pattern of Knapp’s annual salary increases shows that the Board of Trustees still approves of his work on campus, said Jennifer Delaney, a higher education policy assistant professor at the University of Illinois at Urbana-Champaign. 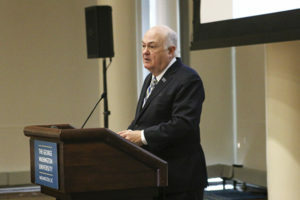 University President Steven Knapp’s annual compensation totaled about $1.12 million in 2014, a 13 percent drop from the previous year. Knapp was the 16th highest-paid private university president in 2012 according the most recent data available from The Chronicle of Higher Education. Among GW’s 14 competitor schools, Knapp ranked No. 4 in 2012. Richard Vedder, the director of the Center for College Affordability and Productivity, said universities often provide incentives like large retirement plans to their top officials as a perks to encourage them to stick with their positions. Knapp’s about “$1 million is still pretty good pay for the job,” Vedder said. Executive Vice President and Treasurer Lou Katz also saw his compensation drop last fiscal year, when it decreased by nearly 36 percent, according to tax forms. In fiscal year 2013, Katz earned almost double the amount his peers did at other universities. Smith said Katz’s compensation decrease was caused by a higher-than-usual compensation in 2012, part of a deferred compensation agreement from when Katz was hired more than three decades ago. This article appeared in the June 9, 2015 issue of the Hatchet.